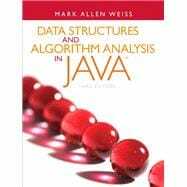 Data Structures and Algorithm Analysis in Javais an ;advanced algorithms ; book that fits between traditional CS2 and Algorithms Analysis courses. In the old ACM Curriculum Guidelines, this course was known as CS7. This text is for readers who want to learn good programming and algorithm analysis skills simultaneously so that they can develop such programs with the maximum amount of efficiency. Readers should have some knowledge of intermediate programming, including topics as object-based programming and recursion, and some background in discrete math. As the speed and power of computers increases, so does the need for effective programming and algorithm analysis. By approaching these skills in tandem, Mark Allen Weiss teaches readers to develop well-constructed, maximally efficient programs in Java. Weiss clearly explains topics from binary heaps to sorting to NP-completeness, and dedicates a full chapter to amortized analysis and advanced data structures and their implementation. Figures and examples illustrating successive stages of algorithms contribute to Weiss' careful, rigorous and in-depth analysis of each type of algorithm. A logical organization of topics and full access to source code complement the text's coverage. Mark Allen Weiss is Professor and Associate Director for the School of Computing and Information Sciences at Florida International University. He is also currently serving as both Director of Undergraduate Studies and Director of Graduate Studies. He received his Bachelor’s Degree in Electrical Engineering from the Cooper Union in 1983, and his Ph.D. in Computer Science from Princeton University in 1987, working under Bob Sedgewick. He has been at FIU since 1987 and was promoted to Professor in 1996. His interests include data structures, algorithms, and education. He is most well-known for his highly-acclaimed Data Structures textbooks, which have been used for a generation by roughly a million students. Professor Weiss is the author of numerous publications in top-rated journals and was recipient of the University’s Excellence in Research Award in 1994. In 1996 at FIU he was the first in the world to teach Data Structures using the Java programming language, which is now the de facto standard. From 1997-2004 he served as a member of the Advanced Placement Computer Science Development Committee, chairing the committee from 2000-2004. The committee designed the curriculum and wrote the AP exams that were taken by 20,000 high school students annually. In addition to his Research Award in 1994, Professor Weiss is also the recipient of the University’s Excellence in Teaching Award in 1999 and the School of Computing and Information Science Excellence in Teaching Award (2005) and Excellence in Service Award (2007).